I'm a vintage watch guy at heart and I can't stress that enough. I pop in at every auction, trade show, and GTG possible to buy, to sell, and, naturally, to get a glimpse of the collectible watch market's dynamic state. As you can probably guess, I scour the web on a daily basis--both in school and out--in search of rare and important timepieces from the likes of Rolex, Patek, and Longines. Amid these searches, I must've come across some fabulous watches, right? Right! Oh, and here they are! Rolex Ref. 6542 "Ultra Tropical Dial"
Eric Ku, over at 10 Past Ten, is highly regarded for his inventory of phenomenally rare and super-cool Rolexes. 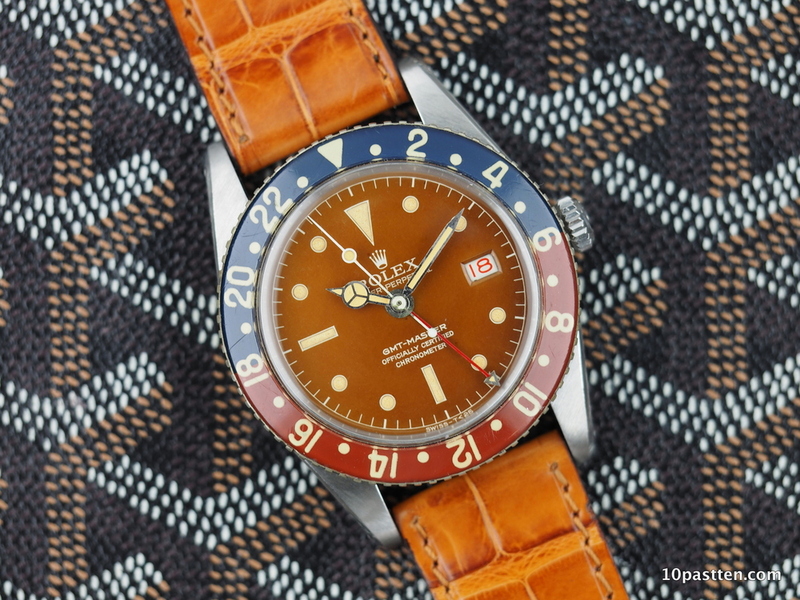 Never once have I laid my eyes on a Rolex, ever more so a GMT Master, with such an evenly patinated dial. Get a load of that rich, brown hue! Aside, the bakelite (or bachelite) bezel is completely intact. A bakelite bezel in great condition is a rarity in itself because most bakelite bezels have cracked due to their frail nature. Alike the bezel, this 6542's case is clearly very crisp. My passion for Longines equals my adoration for vintage Rolex. Miami mega-dealer, Matt Bain, knows a good Longines when he sees one. This fine take on Patek Philippe's reference 570 may be the perfect oversized Longines of 2014, maybe even 2015 too! I wouldn't say the dial makes this watch, but merely the bold 37-millimeter diameter and stunning BOS (beads of rice) bracelet do. Matt only acquires the crème de la crème of vintage wristwatches; meaning, you're getting an all original watch in exceptional condition. You just can't fabricate a "best vintage buys" list without including a classic Patek. The reference 130, hands-down, is Patek Philippe's most venerable manual-wind chronograph wristwatch. It's not unusual to spot a gold 130 floating around, but sourcing a steel 130 can be a daunting task. As any expert would say, condition is an imperative factor in the value of a Patek or any other collectible item, for that matter. This reference 130 is in immaculate condition. Let's just say it's mint. Collectors, get ready to buy the chronograph of a lifetime, seriously. Evidenced by the writing on the photograph above, the seller is Robert Maron. Bob has legend-like status in the vintage watch business. He is a leading dealer and an expert in important vintage and modern timepieces. For further information, please visit www.robertmaron.com. Pre-SIHH 2015: Piaget's Black Tie "vintage-inspiration"